Bake a sheet cake the size that you will need for your party. This was two full sheet cakes put together side by side. With an icing filled bag and tip, size #5 draw the bottle shape on the cake top. Cut the cake away from the bottle shape. Make a cream or ivory colored icing. With your cake spatula, ice the cake in the label area and the neck label area. Add a touch of light yellow in the middle of the labels and smooth and blend it in. Use the cream icing and round tip, size #5 or #7 and outline both labels. 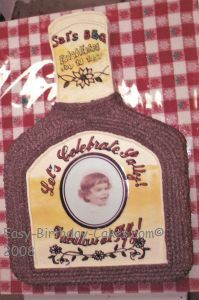 This ways done for a woman's 50th birthday so I enlarged her baby picture, cut it out in an oval and laminated it on both sides and placed it in the center of the label. The message above and below the picture are outlined in black icing using the round tip, size #5 and filled in with red icing using round tip, size #5 also. The flower design at the bottom of the leabel is done in black icing and round tip, size #5. The flower design on the neck label is done the same way. In the middle of the neck label "Established" is written under it. This is also done with black icing and round tip, size #5. Use a round tip, size 33 and yellow icing and go over the center of the black "established" and date. Above this outline, the name and BBQ using black icing and round tip, size #5, fill in with red icing and round tip, size #5. Now make a reddish brown icing and use star tip, size #18 and fill in the rest of the area of the cake.